Crafting Enterprise Experiences Theme Leader: Theresa Neil (Owner of Strategy + Design) Abstract from the EUX website: The enterprise setting forces us to redefine what “good” design means. We’ ll explore how unique factors like complexity, scale, and lack of control can impact our craft and completely change our expectations. Theresa Neil introduced the panel and said that the theme is really about how we make the space to practice our craft, and not just end up in a production role. Tricia’s presentation is about about how to fix the broken model of corporate innovation. Robert will address how we get our arms around complexity. And finally, Craig will speak about how we create resilient design in the enterprise. In discussing a possible presentation talk with Lou, she said that the burning question for her is why craft is at the bottom of enterprise. Why is it always so disconnected from decision-making? It is a really meaty topic, but that is what he wanted her to address. We all know the story of Kodak. In the 1990s they began exploring digital photography. They prototyped the first digital camera, and then filed for bankruptcy in 2012. The technology was so disruptive to Kodak’ s core vision, that it was hidden away. This is a powerful version of the story – it’s the way that the story is told in Clay Christensen’s book – because most enterprises don’ t want to just survive, they want to grow. It’s an easy message to say don’ t be a Kodak and under-invest in innovation. But the way we are telling the Kodak story is totally wrong. The did invest in digital. They used it to improve the interface of their kiosks, and their brick-and-mortar stores. They just never asked the upstream questions like “What does photography look like in the future?” The insights were repackage into their existing business funnel. This important and disruptive idea was made a footnote of a footnote of a footnote. They had genuinely found something new, but their decision-making model couldn’ t account for it. Companies can often succeed innovation but fail miserably at decision-making. They can fail to create change. Clay Christensen tells this story in this way – invest in disruption, throw more money at the problem, but protect your core business. It is a very seductive message – it suggests that innovation is something that can be bought. And in recent years, a huge innovation / design business has emerged. Thousands of design consultancies have been founded on the idea that innovation can be simply be added into an organization. And now innovation consultancies are buying design firms. This is a $680B industry. Is it working? Not as well as it should be. Companies have see 65% decline on return in their R&D investments. No matter how much we pour in, we seem to keep falling short. Earlier in her career, she worked with ethnographers in technology / R&D groups. Her team was uncovering insights, but they don’ t go where they need to go to make impact. And then the business ends up doing more of the same. Why is this so hard? They succeed at innovation, and fail to capitalize on it. The challenge is that insights loose fidelity as they travel up the hierarchy. By the time the insights make it to decision-makers, they somehow seem less powerful, less transformative. The people who found the insights are not present in those discussions. That is why Kodak ended up with kiosks and not iPhones. The reason is that decision-making models being used today were originally designed for railroads. In the early 1800s, a war in Chicago that led to white settlers taking land from Native Americans, and handing it out the land to railroad companies. It was basically land in exchange for track lines. One company built 4500 miles of railroad from Wisconsin to Gulf of Mexico. This really required a new style of business organization – distributed and capital intensive. These were the first enterprise business. It was distinguished by the fact that decision makers removed from craftspeople locally. And even though Illinois Central controlled ticket prices, changes were based on gut decisions, they were not optimized. For many years they were the only game in town. The model was that the person closest to the decision makes it – in this case, the local station master. But then competition stepped in, and in the late 1800s the railroads were bleeding money. Fish (head of Illinois Central) wanted to know the cost to move 1 ton of freight per mile. This was a totally new concept – an early, crude concept of ROI. Eventually the accountant Wellings was able to go from monthly to weekly data. He was their first data scientist, was eventually promoted to Comptroller. This was the beginning of hierarchical decision making. The data goes up, decisions come down. This happened because of the railroad enterprise structure. Fish was also missing direct personal experience, as he was based in New York; there were so many layers between him and those working on crafts. How to understand, when you are not there? Thus, railroads created upwards reporting, and ways of understanding business at a glance. Numbers were prioritized over narrative. This enabled executives to make decisions at a glance, and the added benefit is that they were easier to transmit over telegraph lines. Daily reporting. 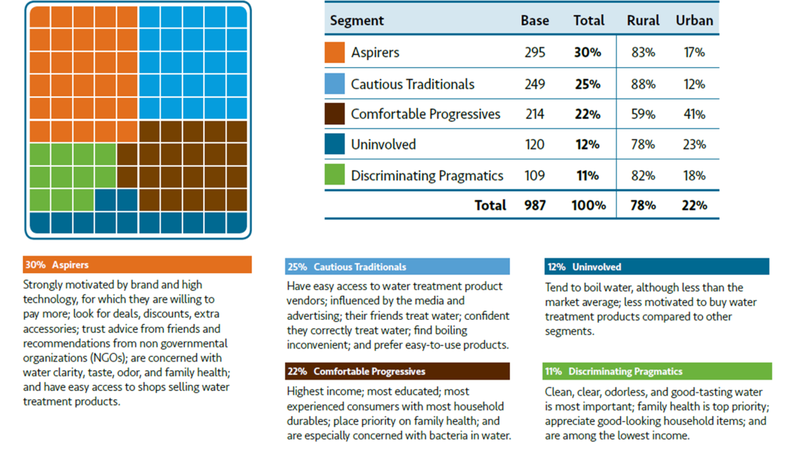 This provided decision-makers with a stream of constant insights. Summarizing data for non-experts. This wasn’t just pioneering new data methods, but ultimately enabling non-data literate (executive) users to make decisions. So, the railroads enshrined these principals. “What can’ t be measured, can’ t be managed.” We still prioritize these ways of working. And they were great for railroads running on preexisting track – all the variables were known. There was only one type of citizen / customer – a white male. And they were operating on government grants. So they literally had the most fixed system a business could operate in. However, with the rise of automobiles, the railroads could not adapt. The reality is that hierarchical decision making just doesn’ t make sense in a dynamic environment. The modern enterprise has innovation inertia. There is a problem, but the problem is not with innovation, but rather how we make decisions in the business context. We can’ t HBR our way our of this. The gap between decision makers and insight generators have gotten bigger and bigger. But what if it was not that way? What if we could access this illusive key to growth? Use both numbers and words to tell a story; we have exaggerated the promise of quant. 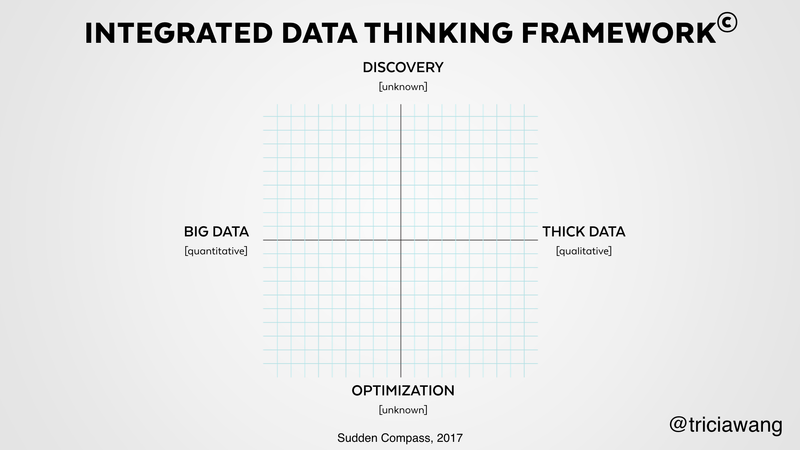 We need thick data plus big data for scale. 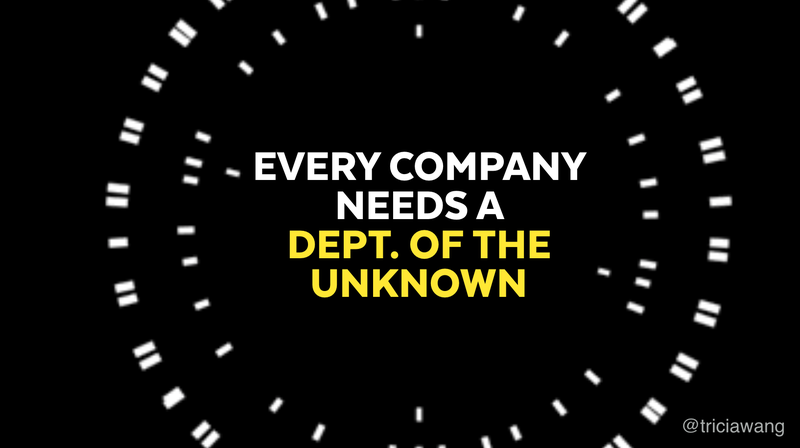 We need to make room to share data about the unknown – all the stuff that doesn’ t fit into daily reports. Instead of summarizing data, our decision-makers should be directly experiencing it. The research team can’ t be the only one experiencing customer and products. Decision-makers have to experience the field firsthand. The key point here is that you have to start with your questions. Once you know the questions, it automatically narrows the range of methods to choose from. For example, a discovery question means ethnography or exploratory data analysis. Alternatively, if you have an different kind of question, you might consider focus groups. This creates a shared language for the whole organization. It allows non-experts to discuss questions, and for qualitative and quantitative teams to collaborate on the right deliverable. And also, it makes clear whether resources are aligned or misaligned to the goals. It doesn’t matter if someone wants to use Jobs to Be Done (JTBD), Lean, etc. It just doesn’ t matter. Let’ s first focus on the question. This helps to avoid tool / methods fetishes. It is important that your decision-making processes account for the enormity of the unknown. With the known. Don’ t pretend to be Tesla if you’ re still a locomotive steam engine. The common thread in major successes is companies that can reimagine the boundaries of their markets. Her partner Matt LaMay describes how product managers can inform decision-making. There are others writing and speaking about the importance of research, design operations. Teams with interdisciplinary skills make decisions in more distributed, un-siloed ways. Those conversations move us close to the consumer, and enable us to connect insights and decision making. In the end, that is more effective for managing complexity. That work has to start with people – there are no pre-laid tracks here, we are moving into the wilderness. Products may be stuck in the past, don’ t deliver on promise, or maybe don’ t work well for users. Why is that still the case? between accuracy and avoiding too much complexity. The first tier is broad roles and usage patterns at the suite level. But when you get into the details, you want a second tier at the individual module level, because you will have different usage patterns. Interactions between roles are also important. 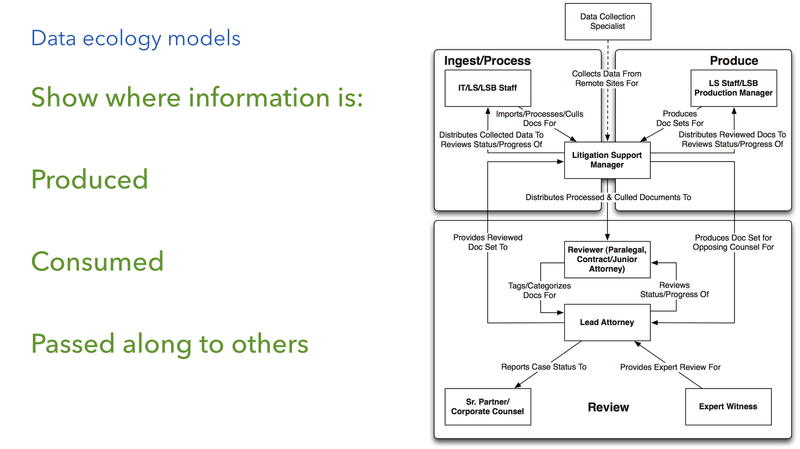 Data Ecology and Sequence Models. These describe where is the information produced, consumed, and how does it get passed on to others. 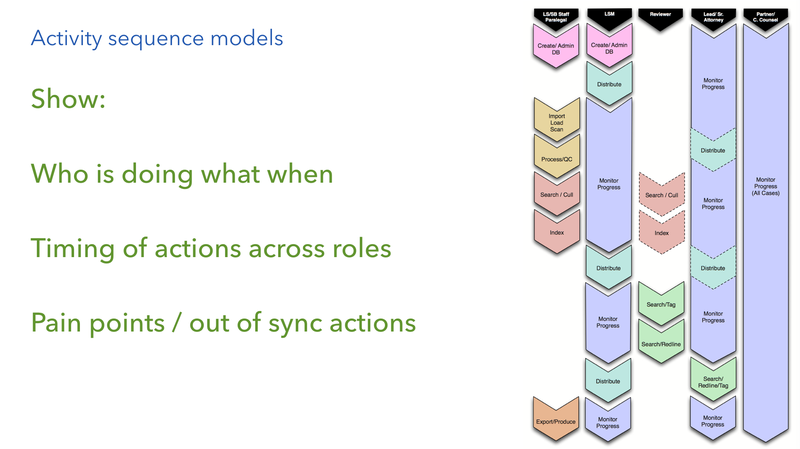 Activity Sequence Model – shows the process over time. 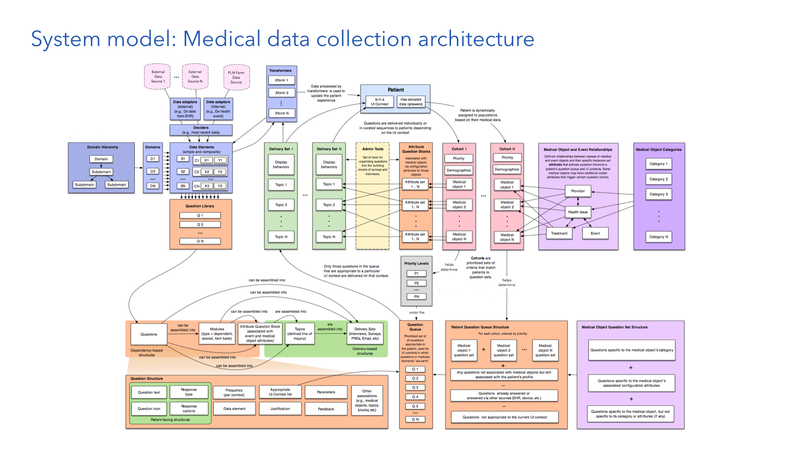 It shows how data is coordinated, and how it flows – which ultimately helps to build the system. Organizational models. 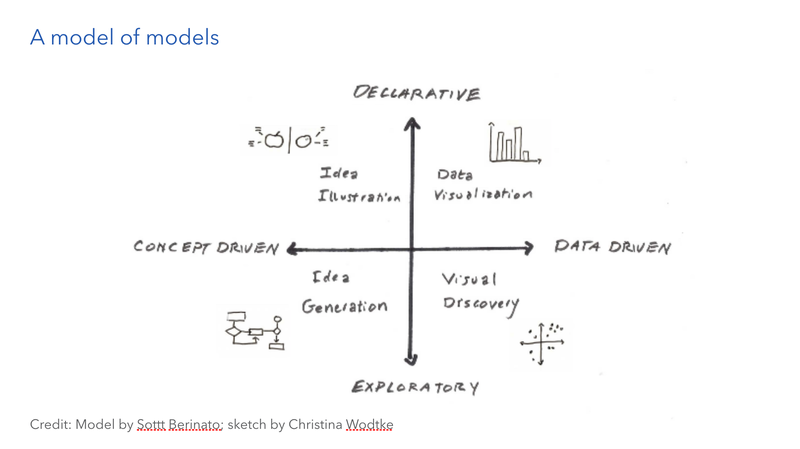 These help to understand business landscape, to understand the right direction for design. This model was called Booz and Company, now owned by PWC. Formalized behaviors, informal behaviors. 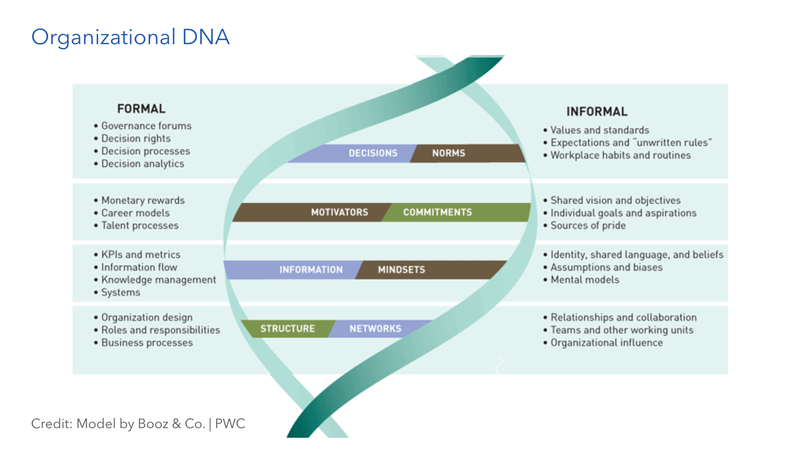 Decision-making policies, incentives to succeed, data, Interpersonal communication styles. Design fails if it’ s not a good match for these. If your RNA is not a good match for the DNA, the patient going to be sick. It’ s pretty standard to incorporate the formal things (on the left). Cutting edge to think about these things on the right. These are hidden complexities that can cause the effort not to succeed. Business Model Canvas. This can help develop business and UX strategy. I hope these are pretty familiar to most UXers by now, so I am not going to elaborate on them here. You can learn more here, if you’re interested. 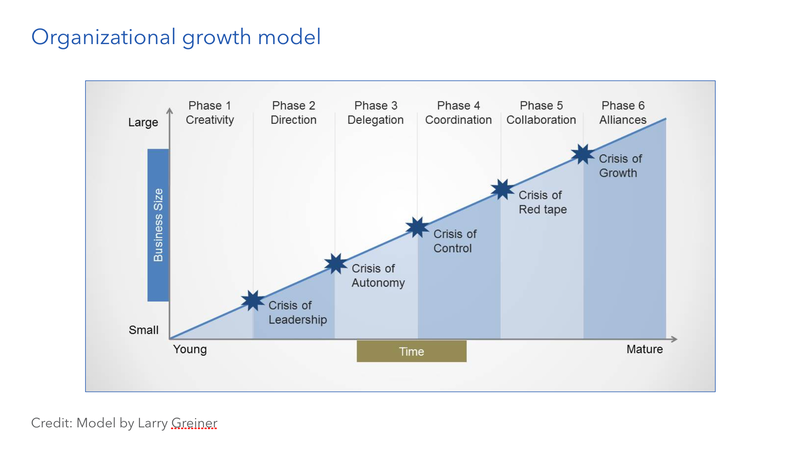 Organizational Growth models. If you’ ve ever started at a small company, everyone is doing everything, decisions are made collaborative. But if the company is successful, that changes. There has to be a bifurcation between upper management and line management. If you keep going, you need to reimagine that organization again, things get more more delegated, FLMs make more decisions independently. Organizations go through that stage, and some of them never leave it. Into Phase 4 and Phase 5, then that’ s when you start building product groups, products divisions – and you get a multi-variate hierarchy. Last is partnerships. This is from 1972, Larry Wiener. This also needs to be considered in enterprise design. Have you taken this into account? 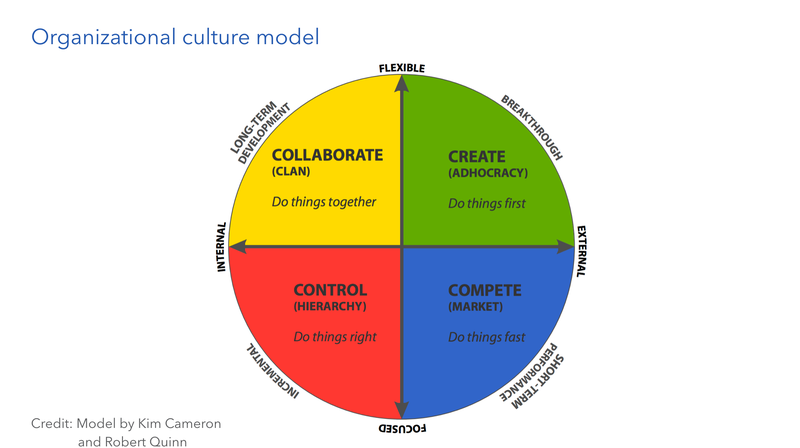 This model describes four different kinds of corporate cultures. Clan – doing things together. So tools that enable collaboration are support important. Adhocracy – innovating and doing something new. In these types of organizations, you need to be able to be flexible think out of the box. So rigid technology (e.g. ERP) will not work – the organizational system will reject it. Control – that is Tricia’ s management technique. Command and control systems would work well here. Lower right is compete culture – getting to market as fast as possible. Enterprise tools can either help or hinder. Here emphasis is on tools that enables better competitiveness, setting appropriate goals. So culture may also inform the best tools for an organization. As an anthropologist, I find this framework terribly oversimplified. But I suppose it might be a useful starting point for others. 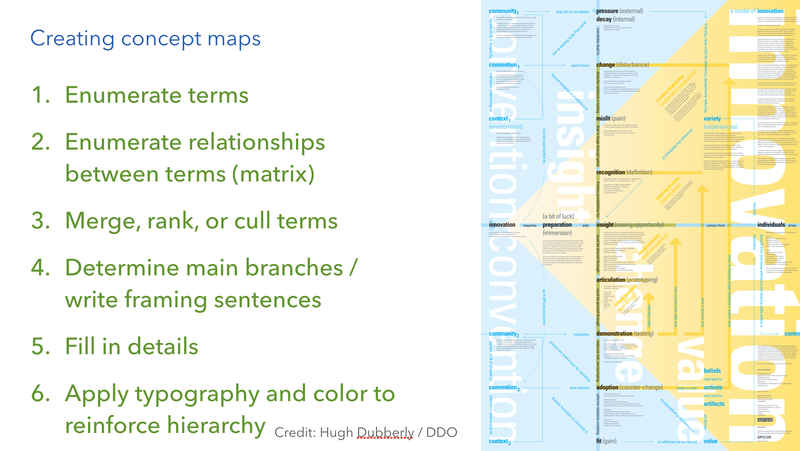 Concept Maps. These models describe complex systems and objects. It’s basically a web of terms connected by words and phrases. I think this was my favorite portion of this talk, as he described in detail how these are made. This work was pioneered by Novak and Gowan, and brought to the UX community by Hugh Dubberly, who has lots of additional examples on his website. Ultimately, these help ensure that the right objects and actions get built into the system. System Models. These provide an understanding the mechanics of the system, with the goal of providing alignment across teams in your organization. In his prior role, he was the Chief Design Architect at Salesforce, where he lead their effort on Lightning. He is going to speak to us about resilient design. The client of an architecture firm wanted a new house on a sentimental family property. The property is subject to flooding, storm systems, and mudslides. So the new place was built 10 feet off the ground. It can withstand a lot of stress, but it is still very beautiful. The idea of consumerization was introduced in 2004 white paper, and it had reached a fevered pitch by 2011-2012. And since enterprises tend to pay for the software they use – we see the emergence of Slack, Asana, Google Suite, dropbox, and others. This created competitive pressure. The big guys like SAP, Oracle, and Salesforce are finally paying attention. UX is finally getting a seat at the table in these organizations. Is this idea over-hyped, over-simplified? How far should we go with the concept? 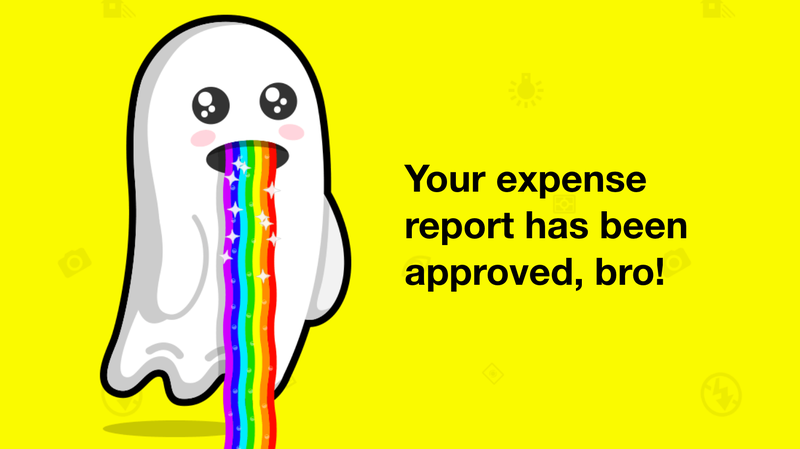 Executive whose kids use Snapchat – can you bring some of those ideas into the solution you’re working on? The reality is that the needs of the enterprise are not identical. We can’ t ignore these differences. Individuals happy, at scale, then making money – great job. 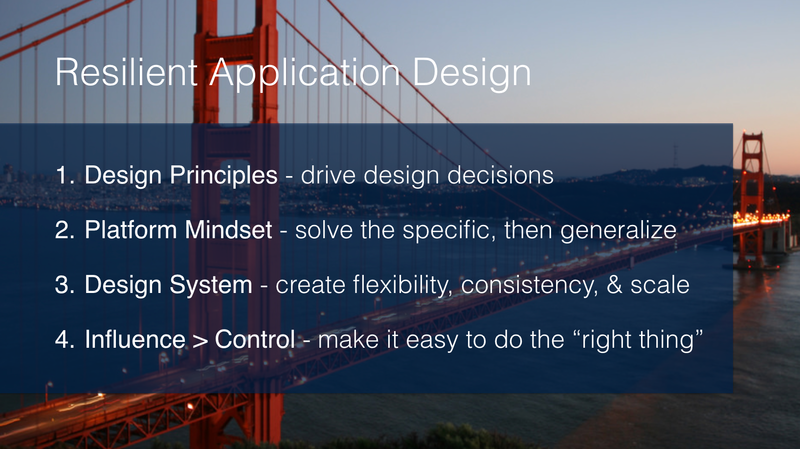 In contrast, designing for the enterprise. We are not focused on individual happiness. Our context and our behavior changes at work. You have other realities due to the context – and you need to get work done. At his current company, the software monitors the performance of critical systems. The end user is IT Operations. They decided to ask folks – in the interest of simplifying the UI, what if we removed all the green? And the answer was an unequivocable no – because the boss needs to see that most are going well. We need to protect people’ s reputation, their career goals. We need to deal with practical constraints. We have to find the right balance between company / buyer and the user. In the Lego movie, President Business is all about control. “All I’ m asking for is total perfection.” We have a very specific idea of what the right experience is. President Business will break out the Crazy Glue and glue those pieces together! But we are not in control – especially not since the introduction of smart devices. We have a ‘ shared hallucination’ that we can control the appearance of web apps. And then, responsive web design came, and it was incredibly important work. But these sites he shared, they are relatively static. What about web applications? They are only focused on layout. But people customize everything! Look at the sheer volume of results for iPhone cases. Bitmoji allows you to customize with your own face, an Snapchat bought them for $100M. 60% of Snaps are customized – so personalization is important. What is the relevance for the enterprise? It isn’ t just a nice to have – companies want to express their brand, culture, values, processes. The larger the company, the more important it is for them. Salesforce (he was there 10+ years) really changed this. They have these things as objects – sheets in a spreadsheet, data in a database. You see things like opportunities, contacts, leads. Custom is anything that the product does not yet track. You can also customize workflows, and much more. 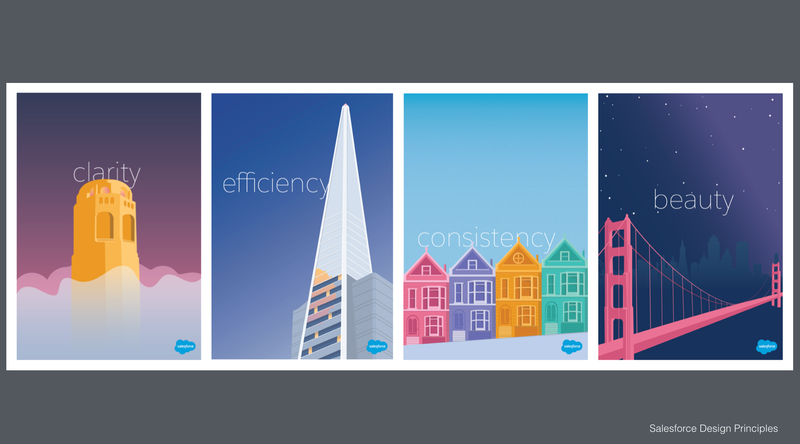 There was a significant loss of control for Salesforce – imagine the page you design looks nothing like what you intended. 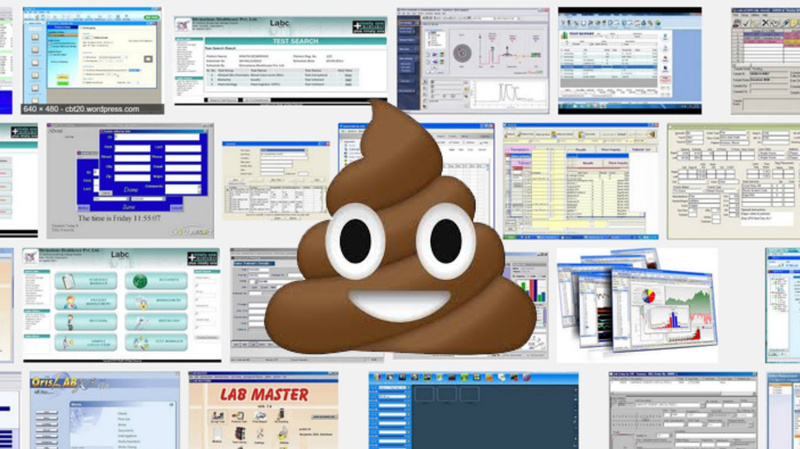 The things your users build may make you cringe, and they may not reflect well on your organization. How might we manage the lack of control over the experience itself without breaking it? We need to design for a universe of outcomes, so we can enable even better design. Golden Gate decided to allow for pedestrian traffic on the bridge. When the put all these people on the bridge – it went flat. They took people off. But the bridge is made to flex up to 10 feet. They took people off because they were worried about crowd control. Like this Bridge, how do we design with flexibility in mind? One of the things that really hit home was this idea of prioritization. Lists have to be ruthlessly prioritized, and justifiable. You want to pit them against each other – that helps to drive decisions. They are portable and memorable if you want them to grown outside your design team. Have a Platform mindset. This enables ‘radical customization at scale’. Create scale with a Design System. Craig talked about the work of Nathan Curtis, who presented at EUX16. You can read about his talk in this post I wrote last year. Understand that influence is more important than control. 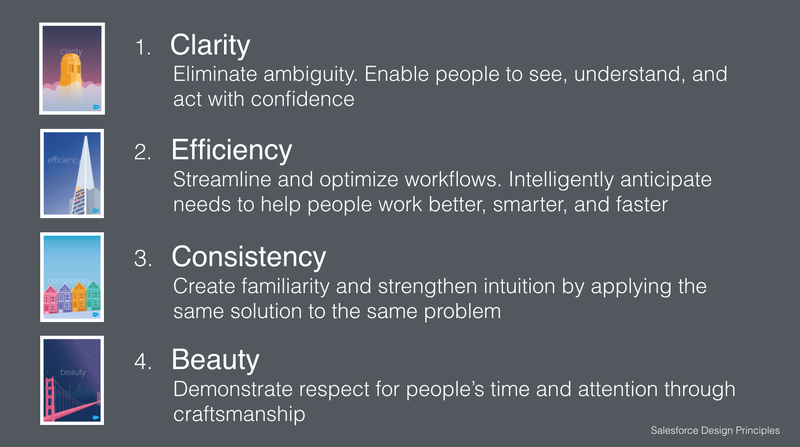 Or as Steve Jobs said when describing the goals for Keynote “make it difficult to make ugly presentations”. In summary, in an era where customization is increasingly expected, we are “hallucinating” if we think we can continue to be successful if we don’t incorporate this reality. Like the Golden Gate Bridge, we need to be able to bend without breaking. We experienced some delays at the start of the conference due to technical issues, so the Q&A was handled at lunch tables after the session.